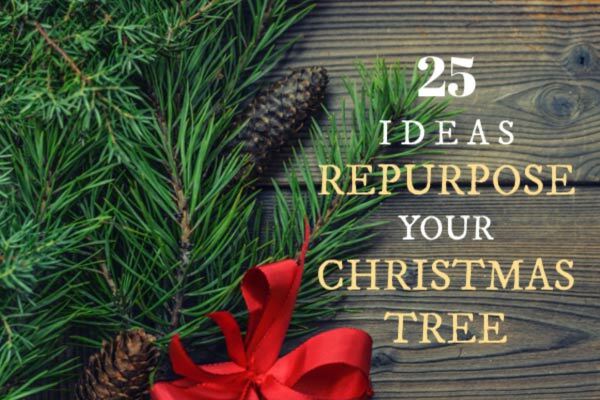 If you want to upcycle or recycle your Christmas tree after the holidays, there are plenty of options. A once-living tree provides lots of wood for making all sorts of creative and practical things from the wood slices, branches, and twigs. Hey, do you mind if I take your old Christmas tree? After the holiday season, there are a lot of xmas trees being tossed out! And that’s a lot of useful wood, either for basic gardening (mulch, edging, plant supports) or countless craft and decor projects. Once you realize how precious a resource it is, you may just want to ask your neighbours if you can have their unwanted trees too. To make use of an old tree, you’ll need a saw (hand or powered) and space to make a mess while you lop off the branches and slice up the trunk. From there, there are numerous things to make. And you don’t have to do it right away: it’s fine to simply stash the tree or wood for later use. We do new stories like this every week, so be sure to subscribe to our gardening podcast to hear the latest episodes. Or, if you have an Amazon Alexa device, you can enable our Flash Briefing. It’s easiest to work with the trees when they have dried out and the needles are falling off (or gone) but I shall accept the fact that you may be impatient. I like to examine the structure of the tree first and look for any unique branch shapes that I might want to incorporate into a project. With the tree secured to saw horses, I use my chain saw to remove all of the branches, leaving me with a tree stump and many branches to work with. The next step will depend on what you’re making. Think before you slice. The National Christmas Tree Association site has images of each type of tree here. Keep in mind that your tree was recently alive with sap inside. When you cut up a xmas tree for crafting, it can get sticky. The sap releases and it can gum up your saw (or clothes). There’s not really a simple solution for this so just keep it in mind while you’re working. If you’re making indoor projects, you may want to de-bug the wood to kill any insects still living in the wood. After cutting your wood slices, place them on a lined baking sheet in a 175F/ 80C oven for 2-3 hours. Then make your crafts. For finer crafts, use a circular or other power saw (if the wood is not too sappy) to get nice, smooth cuts. Alternately, you could use a hand saw. For more rustic projects, you could also use a chain saw. It’s lightweight, easy to handle, and useful for all sorts of garden work (we get a lot of fallen branches). Depending on how cleanly your saw cuts, you may also want to sand the edges of your wood pieces. Assuming your tree is all-natural and has no sprays or paints on it, it has many uses in the home and garden. It’s just like any other wood, except at this point it’s free and has a lovely rustic look. 1 Chop it into firewood and fire starters. 2 Chip it into mulch. 3 Create an outdoor bird feeding station. Secure the tree in place and add bird feeders and suet cages. 4 Use the leftover greenery (branches) for winter wreaths, window boxes, and urns. 6 Use the wood for DIY garden trellises, arbors, obelisks, privacy screens, and plant supports. 8 Make a log bird feeder. 9 Create tree branch coat hooks. 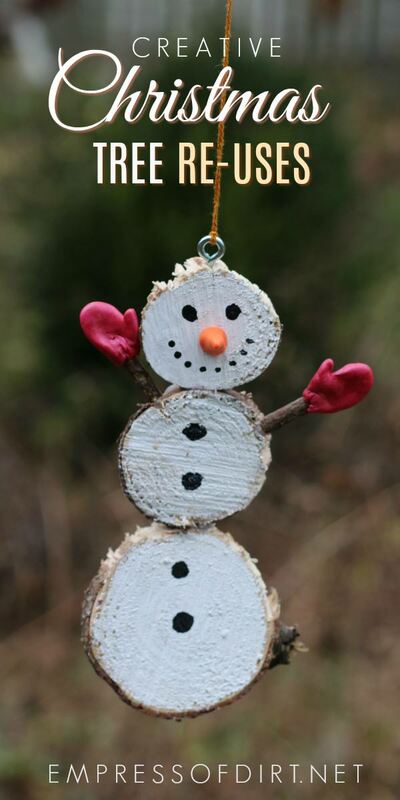 11 Make wood stump snowmen. One tree provides a good number of wood slices! The thinner you slice them, the more you get. I guess you knew that already. There are so many possibilities. Some trees are not sappy at all and work great. Others can be really sappy and mess up painted surfaces. You just have to be willing to play with it. You know: try stuff out and have fun. Besides leaving the wood in its naturally beautiful state, you can get crafty with all sorts of materials. The smoother and drier the surface, the better these methods work. Woodburning – see Wordburning 101 for free instructions. Paint (I use white latex wall primer and acrylic craft paints). Photo transfer. Add your favourite images to wood slices. I have a complete guide on image transfer methods here. 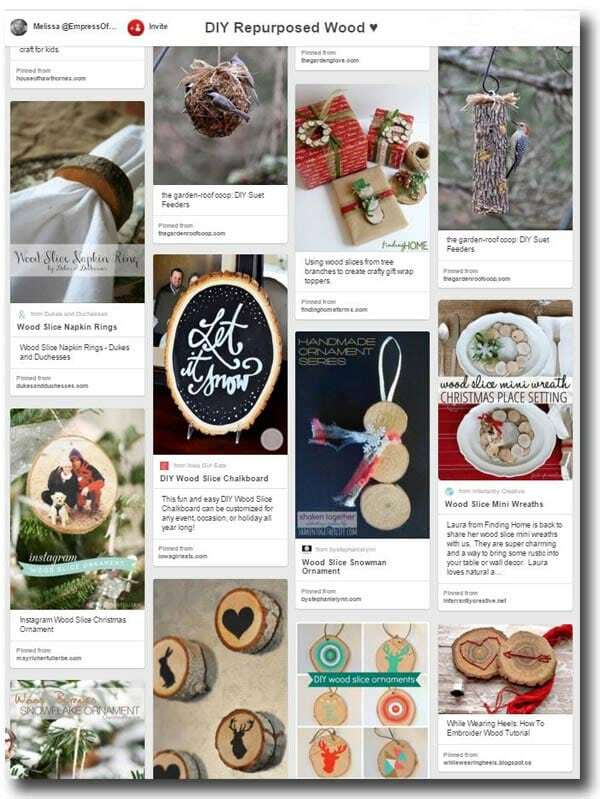 This is my Pinterest board showing the projects. 12 Make a wood slice garden border edge (use wood slices or branches and tree trunks). 13 Create wood slice garden path stepping stones. 14 Make a wood slice decorative wreath. 15 Make a bird feeder or fairy house with branches and wood slices. 16 Make wood slice garden signs (put a letter on each wood slice) or form letters with the wood slices. 17 Make wood slice coasters. 18 Make branch candle sticks. 20 Make a wood slice clock. Unless your tree is massive, it could just be a little clock. 21 Make seasonal ornaments including wood slice snowmen, winter, and Christmas ornaments. 22 Create a banner (a letter on each slice, spelling a message). 23 Make buttons from thin branches. 24 Make a wood slice necklace. 25 Make wooden building toys for kids. If you want to dispose of your Christmas tree, this article has tips for getting rid of real and artificial trees including those with flocking. There you go! 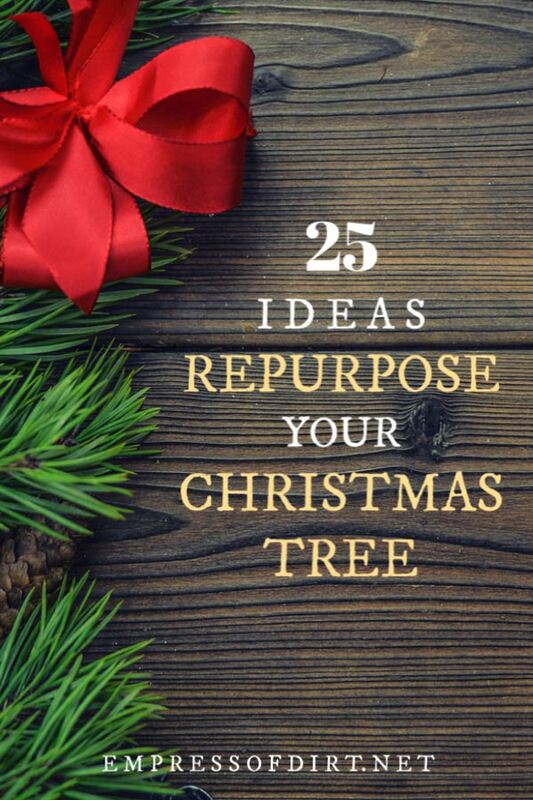 Now go nab some old trees and get crafty! If the sap is causing a problem reach for he veg. Oil. Pore a little on your hands and then rub it in well. Then whip your hands with a paper towel to help remove sap and oil. Next wash your hands with warm water and any of your favourite soap. I don’t see why a little on saw blades before and after wouldn’t be a ad idea.